The average woman will spend more than £14,000 on her hair in a lifetime, a new study has revealed. Researchers found that trips to the hairdressers, grooming products and styling accessories will set a woman back around £37 a month. Over the course of the year, this adds up to just over £439 – or £14,053 between the ages of 18 and 50. It also emerged that blondes face the biggest bill of £506 a year – or £16,207 over a lifetime – which is £3,000 more than the £13,184 dark-haired women will spend. Redheads will spend £442 a year or £14,138 over their lifetime. Sacha Mascolo-Tarbuck, Global Creative Director for TONI&GUY, which commissioned the research to mark the salons’ 50th anniversary, said ”Hairstyle and colour is important to many women, and that is reflected in the amount of money they are willing to spend on it. ”It might not seem like a huge amount each time you buy something for your hair or go to a salon, but when you add it up over a few years, it’s really quite staggering. ”But you can’t beat that feeling of walking out of the salon with a brand new style or colour – regardless of how much it has cost you. The study, of 2,000 women revealed that the biggest chunk of cash is spent on haircuts, with an average of £29.99 spent on each of the five trips to a salon a year – an annual total of £149.95. A further £119.95 is spent on getting hair coloured an average of five times a year, with block colour and highlights the most popular choices. Shampoo and conditioner amounts to £6.76 a month, or £81.12 a year, while other hair products such as wax and hairspray add another #49.56 to the annual total. 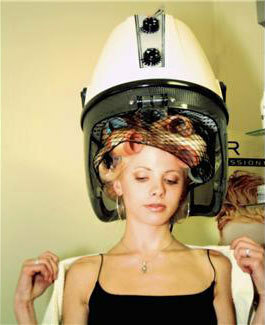 An average of almost £20 is also spent on accessories such as clips, hairbands, hairdryers, straighteners or tongs. And it doesn’t end there as the study also found that the average women will spend £19.49 a year on extra trips to the salon to have their hair styled for a wedding or party. But researchers found that, despite the massive spend, 83% of women see every penny they spend on their locks as money well spent. And almost six in ten would be willing to part with however much cash it takes to keep their hair looking its best. But 17% of women admit their partner has moaned about the amount of money they spend on their hair, with 16% even rowing over it. It also emerged that seven in ten women enjoy getting their hair cut and styled at a salon and more than three quarters say it’s important to them that their hair always looks good. Almost four in ten women also like to make sure they stay up-to-date with the current hair trends and styles rather than sticking with the same look each time.